This year's Mobility Roadshow will be staged indoors and outdoors at the Donington Park Motor Racing Circuit, Derby on 25-27 June presenting mobility solutions for a wider range of consumers with restricted mobility to help them achieve greater independence. It is the most comprehensive lifestyle event of its kind in the UK, . The Mobility Roadshow showcases products and services to help maintain independent mobility. 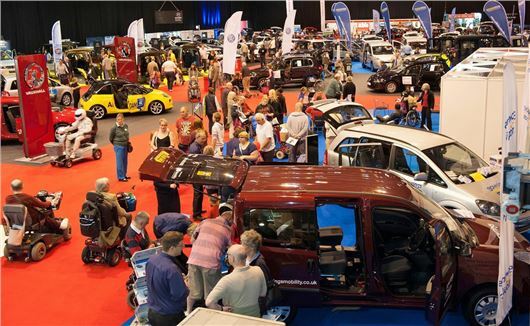 This unique national show is organised by registered charity Mobility Choice. For 2015 the Mobility Roadshow returns to Donington Park where visitors will have the rare opportunity to test-drive adapted and wheelchair accessible vehicles (WAVs) on the historic Donington Circuit, as well as experience the very latest innovations for independence. No other event offers such a wide range of vehicles for test-driving, or of products and services to see and compare – a unique opportunity unequalled in the mobility exhibition calendar. The 2015 Mobility Roadshow will have a refreshed format: dynamic, engaging including features for a wider audience. It will offer invaluable benefits to all visitors ranging from children to mature individuals who are looking to enhance their freedom, with hands-on product demonstrations and exclusive show features. Restricted mobility affects millions of people across the UK in different ways. Hence the opportunity to experience and compare wide-ranging independent living solutions all in one location is vital. The Roadshow provides a larger, more diverse showcase than other regional shows. Not an ‘exhibition’ but an ‘event’, the 2015 Roadshow will also incorporate Get Going Live! – a sister event also organised by Mobility Choice that focuses on young and novice disabled drivers. This lively and exciting feature will open up a new world of driving opportunities for future generations. Further news updates will follow. As a registered charity, Mobility Choice delivers the latest mobility advice, news and support to assist disabled individuals with enhanced independence. It was established in 1998 with the primary role of organising The Mobility Roadshow, originally set up by The Department of Transport. It has continued to pioneer inclusion for all through a series of additional programmes and events including the test-driving day for young and novice disabled drivers, Get Going Live!